The Cobo Arena plays host to concerts, sporting and civic events. In addition to the Rockers, Cobo is home to the Unversity of Detroit-Mercy Titans Basketball team. Cobo has also welcomed such prestigious events as the Bill of Rights Tour, filming of scenes from the Hollywood movie "Hoffa", appearances by President Bill Clinton, former President George Bush, "Regis and Kathy Lee Live", Bob Seger got his start at Cobo Arena and the North American Karate Championship. 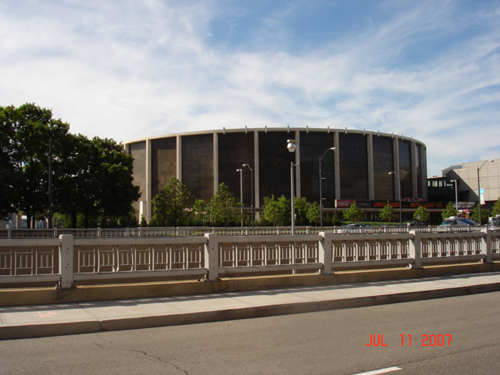 For 1974-1975, the now renamed and relocated Michigan Stags began play at Cobo Arena in Detroit. The idea was to offer the club as an alternative to Red Wings Fans. However, the team had overextended itself in player contracts, leaving no money for advertising. Crowds of less than 2,000 were evident on most nights, and the WHA's schedule maker had helped the problem by booking Gordie Howe and the Houston Aeros into Cobo Arena in February. The opportunity for Red Wings fans to see Howe play was scuttled when the Stags folded on January 18, 1975, playing their last game that day in Cleveland, losing 2-1 to the Crusaders. The WHA, not wanting to see a franchise fold in midseason, formed the Baltimore Blades to play out the Stags' schedule. Atrocious attendance and few victories spelled doom for the Blades. Although there was a planned move to Seattle, it never materialized, and the Blades folded in late May 1975. A dispersal draft was held in June. Detroit, Mich. - City inspectors are concerned about the safety of the parking garage that serves Cobo Arena along with another parking facility nearby. Reports say concrete is crumbling at the garages and that inspections should be made to determine what repairs are needed. 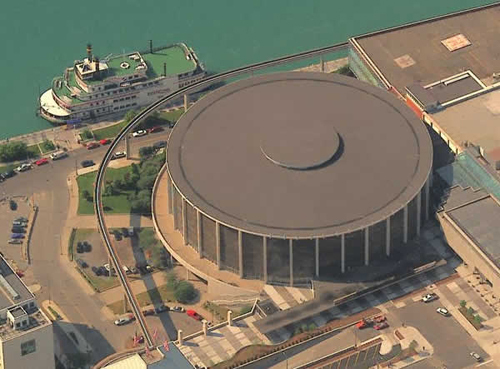 Reports found problems at the Cobo Arena Garage including defective concrete walls, ceilings and floors with exposed reinforcement bars and violations for improperly maintained fire and smoke stop doors. Inspectors also found problems in the Cobo Center garage and on the Cobo Center roof parking deck, but did not recommend closure.